According to Jesse Karmazin, founder of a new startup called Ambrosia, Elizabeth Bathory came tantalizingly close to discovering the fountain of youth. Bathory is considered the most prolific serial killer in history, and her story inspired many popular vampire tales. Bathory believed that she could keep herself young by bathing in the blood of young women. But apparently her problem was the whole bathing thing, which doesn’t actually do anything. To get results, Bathory should have injected the blood instead. At the Recode conference in Rancho Palos Verdes, California, Jesse Karmazin, who leads the small biotech startup Ambrosia, told New Scientist that he had positive results from a preliminary trial injecting older patients with younger plasma,the liquid part of blood that doesn’t contain any cells. A month after receiving a transfusion of young plasma, Karmazin says, participants had fewer chemical biomarkers indicative of heart disease, Alzheimer’s, and certain types of cancers. The results are extremely preliminary; they not published in a peer-reviewed, and there was no control study. Ambrosia got the US Food and Drug Administration’s approval to begin conducting a controversial clinical trial in May 2016, and participants essentially pay for the unproven treatment out of pocket. For $8,000, healthy individuals over 35 can have a transfusion of plasma from someone aged 16 to 25 as part of an ongoing clinical trial. 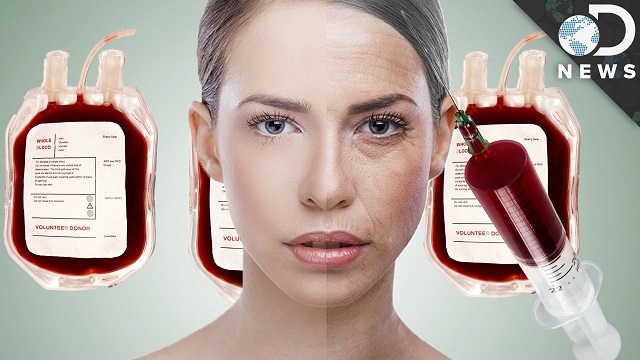 There is some evidence that blood from younger individuals can improve some of the issues of old age. The mouse researchers who first discovered it believed that the reason it worked was that younger blood contained more stem cells, and if that’s the mechanism, plasma alone won’t get the job done. But that probably won’t stop a few rich folks from giving it a try anyway. They’ll feel better too, at least at first, because placebo is a thing and the mind has some capacity to heal the body based solely on belief. If this turns out to work, we may find ourselves living in a world of vampires. They just won’t be the undead kind. Wow! I wonder what the implications would be if this passed clinical trials? A fountain of youth, perhaps?